Where did it come from? Bookmooch. Why do I have it? This was one of the first books that I put on my wishlist because of blog buzz, although I don’t remember where specifically I saw it first. How long has it been on my TBR pile? Since 04 December 2008. Summary: Josh Ryder is a photojournalist on assignment in Rome, when a suicide bomb knocks him unconscious. He recovers, but the incident triggers flashes of hallucinatory clarity, visions of himself in ancient Rome, memories of dire events that Josh never lived through… or did he? 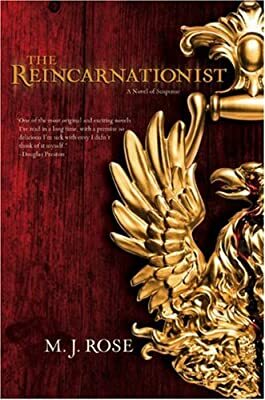 He finds his way to the Phoenix Foundation, an institute that specializes in past-life experiences. When his involvement with the foundation lead him to an archeological dig outside of Rome – the possible tomb of one of the last Vestal Virgins – Josh becomes increasingly convinced that this site – and the woman buried alive inside of it – are of special significance to him personally. On his first visit to the tomb, however, Josh witnesses the murder of the site’s lead archaeologist, and the theft of an ancient treasure of great power. It then becomes a race against time, for Josh must not only recover the treasure, but also deal with the increasing sense of urgency generated by his flashes: to somehow find and save the woman that he failed so desperately in a previous life. Review: Color me underwhelmed. I’d heard so many good things about this book, and I was really looking forward to reading it, so I’m disappointed to say that it didn’t live up to expectations. The premise as well seemed incredibly promising, and the fact that it featured one of my favorite story devices – interweaving past and present timelines – was in its favor. And, in truth, as I read I did find the plot interesting and involving, but I was underwhelmed by the pacing, the writing, and the characterization. My main problem was that things just seemed to happen arbitrarily, with scenes often coming completely out of left field, and key explanations of what was going on either severely abbreviated or missing altogether. (For example, about 3/4 of the way through the book, the as-yet-unnamed bad guy is revealed to not only be a master of disguise and a criminal mastermind, but also a skilled hacker as well? What?) Most of the various pieces come together satisfactorily in the end, but for the bulk of the book, things just seem to be cobbled together in no particular order, and the rhythm and flow of the storytelling just felt off. There was also too much going on for any one piece of it to be fully developed. Too many characters for even the leads to have more than one dimension, too many past lives and plotlines for any one story or relationship to be particularly involving (the Percy/Esme flashbacks in particular I found to be overkill). In general, I was spending so much energy trying to make sense of the haphazard arrangement of the plot that I didn’t have much left with which to care about the characters. I’m giving this book the benefit of my good mood, though, because I really did find the story to be fascinating, even if I wasn’t particularly enamored of the structure in which it was told. 3 out of 5 stars. Recommendation: Eh. Some people seem to love it, so it may just be an idiosyncratic case of me not getting along with Rose’s prose style. But as novels about reincarnation go, I enjoyed Daniel Quinn’s After Dachau much more. Other Reviews: Like I was saying above about the blog buzz? Yeah, there’s roughly a million reviews for this, and I’m feeling lazy. Check them out at the Book Blog Search Engine! First Line: Josh Ryder looked through the camera viewfinder, focusing on the security guard arguing with a young mother whose hair was dyed so red it looked like she was on fire. p. 57: “He let the book fall open to the soft leather bookmark with his initials stamped on the cordovan in gold, at the beginning of a chapter titled “The Soul in the World of Souls after Death.”” – a soft, smooth leather originally made at Córdoba of goatskin but later made also of split horsehide, pigskin, etc. Sorry to see you didn’t love this book. I’ve got the whole series here waiting for me. Kathy – I hope you like them! Lots of people seem to, so it’s entirely likely that my reaction was just a case of my idiosyncracies not quite getting along with the book’s idiosyncracies.